Which 2019 Nissan Altima Is Right for You? The Nissan Altima is a solid mid-size sedan that offers comfort, without the expense of a luxury car. It's similar to the Maxima, but a little smaller, and not quite as posh. Still, it has a distinctly upscale vibe that makes it stand out on its own, especially with this 2019 redesign. The hardest part of buying this awesome auto is choosing between the eight different options. The 2019 Nissan Altima S has a starting MSRP of $23,900. It's equipped with a 188-horsepower 2.5-liter four-cylinder engine and front-wheel-drive powertrain. Its fuel economy ratings are 28 mpg in the city and 39 mpg on the highway. It also comes with Bluetooth capabilities, Siri Eyes Free, intelligent auto headlights, and Nissan Intelligent Key for quick and easy access to your vehicle. The Altima S also has cruise control, which is essential for long drives. Cabin features that the driver will appreciate include an 8-inch touchscreen display with Nissan Connect and an 8-way power adjustable driver's seat. Safety features include intelligent forward collision warning and automatic emergency braking. An AWD option is also available for an MSRP of $25,250. The 2019 Nissan Altima SR starts at $25,250 for a FWD powertrain. The engine is the same as the Altima S. On the exterior, the Altima SR upgrades the wheel size to 19-inch aluminum-alloy from 16 inches. Inside, the steering wheel is leather-wrapped, the shift knob is leather-wrapped, and paddle shifters are added with manual mode. For extra sportiness, Nissan added a seat cloth seat trim and carbon fiber-look trim. The exterior comes with LED headlights with signature and dark chrome V-Motion grille. An AWD version of the Altima SR is also available with the same features for $26,600. The 2019 Nissan Altima SV starts at $28,080 for a front-wheel-drive powertrain. The Altima SV features ProPILOT assist, automatic emergency braking with pedestrian detection, and intelligent lane intervention. Those safety upgrades are more than enough to justify the higher price over the other trims. In addition to the added safety features, the Altima SV has 17-inch aluminum-alloy wheels and a power sliding glass moonroof. An AWD version of the Altima SV starts at $29,430. The 2019 Nissan Altima SR VC-Turbo is the first engine upgrade that the Altima gets. 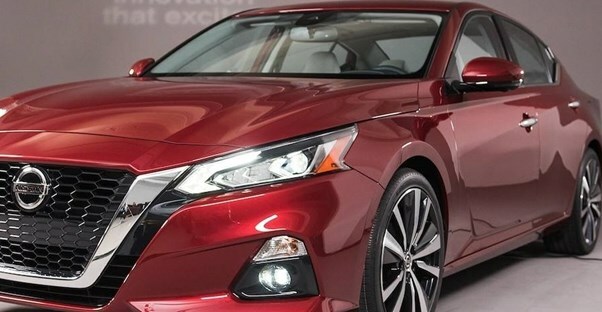 It has a starting MSRP of $29,300, making it the next most expensive trim, but it actually has more in common with Altima SR than the Altima SV that precedes it in price. It comes with a 2.0L variable compression turbo (hence the name) engine that is capable of 248 horsepower and 273 pound-feet of torque. To go along with the turbo engine, the car has a sport-tuned suspension. Other comfort and convenience features include in-cabin microfilter, remote engine start, rear door alert, plus map lights and rear reading lights. The front seats are also heated. There is no all-wheel-drive option at this trim level. The 2019 Nissan Altima SL starts at $29,990 and feels much more luxurious than the previous model for one reason: leather-appointed seats. This price level is for the front-wheel-drive powertrain, and the 2.5L 4-cylinder engine that has an output of 188 horsepower makes a return. The inside has a few other upgrades that make the Altima SL worth the cost, including an auto-dimming inside rearview mirror and four-way power adjustable front passenger seat. The best upgrade is the addition of a Bose Premium Audio System with nine speakers including woofers. Additionally, Nissan Connect services powered by SiriusXM with complimentary trial access to 3-year Select and 6-month Premium Plus packages is included. An AWD version of the Altima SL is available starting at $31,340. At a starting MSRP of $31,930, buyers can opt for the 2019 Nissan Altima Platinum. It includes the same engine from the Altima SL, but the wheels are upgraded to 19-inch aluminum-alloy wheels. A couple upgrades that the Altima Platinum includes are driver's memory seat and intelligent around view monitor. This provides a virtual 360° bird's-eye view of the car so that drivers can maneuver into and out of parking spaces with ease. Interior accent lighting is also standard on this trim level. An AWD version of the trim starts at $33,280. The 2019 Nissan Platinum VC-Turbo sees the return of the 2.0L variable compression turbo engine. It revs up a hearty 248 horsepower and 273 pound-feet of torque. Like the previous Nissan Platinum trim, the Platinum VC-Turbo has 19-in aluminum-alloy wheels, driver's memory seat, interior accent lighting, and intelligent around view monitor, all for $34,930. The only downside is that this trim won't be available until later in 2019, compared to the previous trims. An AWD option is not available at this trim level. Lastly, the priciest trim is the 2019 Nissan Altima Edition ONE VC-Turbo with a starting MSRP of $35,750. It's mechanically identical to the Altima Platinum VC-Turbo; what sets this trim apart is the cosmetic upgrades that come with Nissan's Edition ONE package. These upgrades include 19-inch dark gray aluminum-alloy wheels, rear spoiler, external ground lighting, and Edition ONE carpeted floor mats. Like the previous trim, there is no AWD option. What truly sets the Edition ONE model apart from the other Altimas is the included Nissan Concierge service. Drivers will be able to access a professional concierge team 24/7, complimentary for 3 years, who can help with virtually any task via phone, text, email, Amazon Alexa, or Google Assistant. These concierges can help you access weather reports, movie and event tickets, dining suggestions, directions and traffic conditions, sightseeing information, flight statuses, and vehicle questions. Which 2019 Buick Regal TourX Is Right For You?